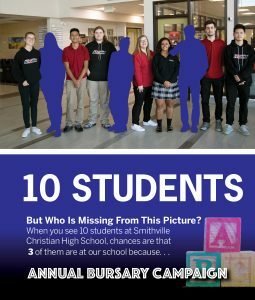 Three out of every ten students at Smithville Christian High School are able to attend this school because of the generous support of the donors who contribute to the Annual Bursary Campaign. 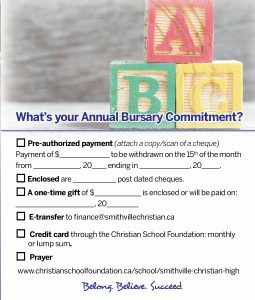 The annual bursary celebration, held in March each year, is a celebration of what students learn and experience at Smithville Christian High School, and the impact that a Christian education has on them and this world. The celebration features student testimonies, alumni stories, art and music, in a casual dining atmosphere. All gifts, large or small, are gratefully appreciated, and are used to allow many more students to attend Smithville Christian. Read on to learn more about the impact and how you can give. Will you join us? 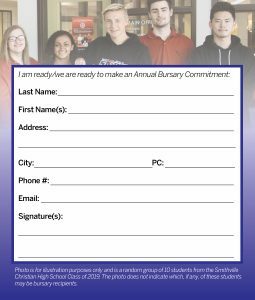 What's your Annual Bursary Commitment? Use the Donation link below to add your gift. School supporters also organize a fundraising golf tournament, held every September. 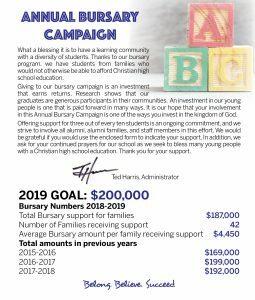 The proceeds of this event are divided between the Niagara Association for Christian Education (which operates two of our partner elementary schools) and Smithville Christian High School. The 2018 edition will be held September 15 at Sawmill Golf Course. To register as a golfer, click here. 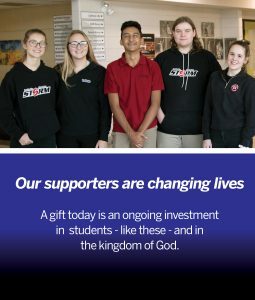 The golf tournament gives opportunity for supporters, staff, students, alumni and local business persons to interact in support of Christian education. 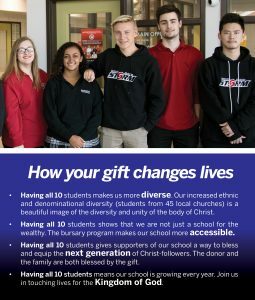 The proceeds allotted to our school are used to fund our bursary programs. To sponsor a hole, to help organize the tournament, or to play golf, please contact Ted Harris or Kevin Huinink.